Great little find by John Gruber, of Daring Fireball, the other day: Evolution of the 007 James Bond Movie Logo Design, which was originally posted on The James Bond Lexicon, a Tumblr site. 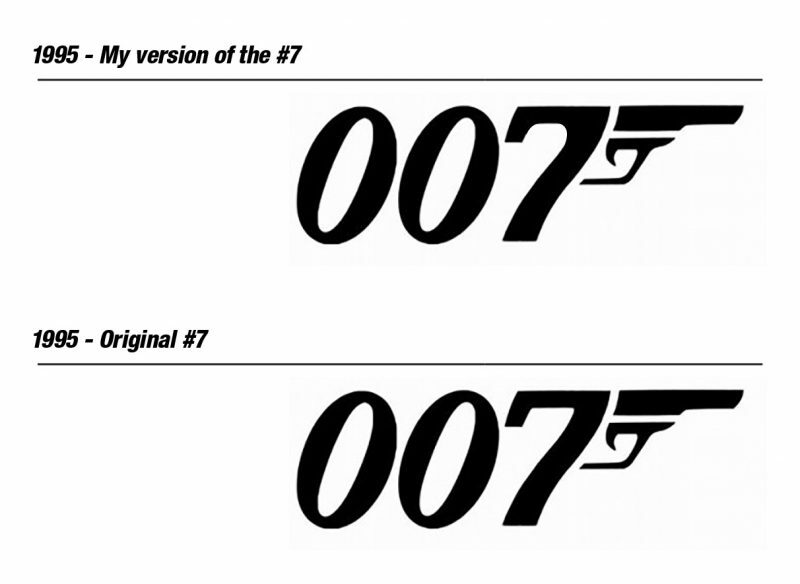 Don’t think I’ve ever really given much thought to the actual logo for 007, at least not until now. Some quite subtle changes every few years until 1993, then they finally seem to be satisfied with the logo. Or, they just got fed-up changing it for every movie. I liked the inner curve of the 7, from version 1962 up to 1987, then they straightened that inner space out, and I’m not sure I like it as much. It was a very distinct #7, and I think they could have managed it, even though they’ve been thinning out the overall logo each time. I get that the #7 served purpose of acting at the guns handle, but I think a little subtle inner curve would have been nice. So practicing what I sort of preach, and just for shits-and-giggles, just quickly mocked-up what I feel looks nice, and keeps with the previous styles without being too clunky and fat.